Pattern: New Wave Quilt from Oh, Fransson! Modifications: Since I wanted a smaller quilt I only did 7 of the "waves" and shortened the length. I also added the gray border so the wave sequence was centered. I think it makes it look less busy and more focused - which I prefer over the original design for a quilt of this size. It's hard to see in the picture, but I stipple quilted this with orange thread - it contrasts really well. This valance was salvaged from the nursery bedding. Since no one uses bumpers anymore, we decided to try and turn a part of the bumper into a valance. It was really easy, I just cut it down and then hand-sewed the seams to close (there was a little more to it, but that's the overview). 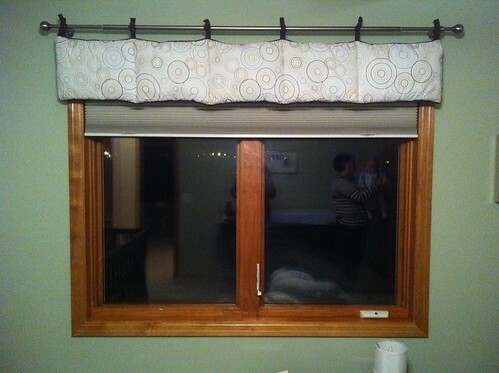 Since the bumper already had crib ties you can simply use them to tie it to the curtain rod. Modifications: I just shortened the length of the arms and the body a bit. 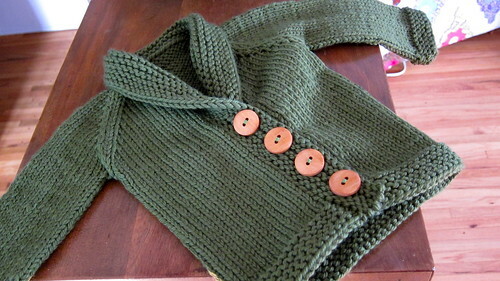 Otherwise this knit true to gauge and came together really quickly. I love the rolled collar - he looks like a little professor! Judging from the "happy smile" on his adorable face, he loves his new sweater! You are so multi-talented, Brandy! Thanks for sharing all the details on your projects! Love the sweater!! The buttons are almost as cute as Luke! 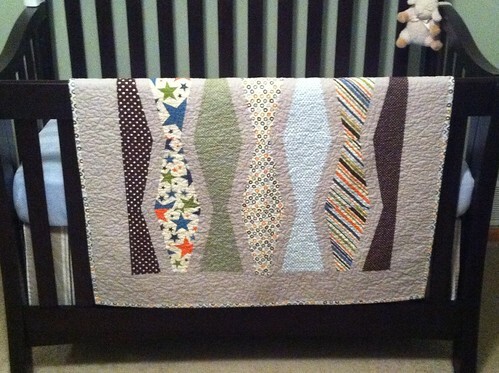 Luke's quilt is beautiful! 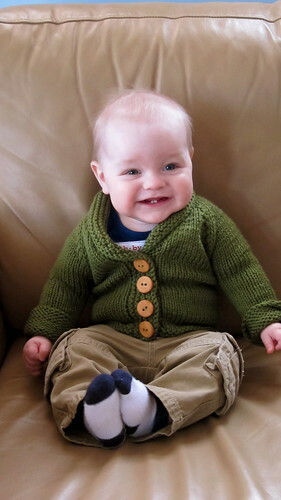 I made that same sweater for a friend's baby. It is a quick knit!